Tapping is the new acupuncture. Known as Emotional Freedom Technique (EFT), it works in the same way as acupuncture, by unblocking the meridians or energy pathways throughout the body. The nice thing is though, no uncomfortable needles and, best of all, you can do it yourself. The speaker at our meeting on 14th April, Diane Holliday, an advanced EFT practitioner and professionally trained in a variety of alternative and holistic therapies, explained that everything is interconnected. The root of any negative emotion is a disruption in the body’s energy system. This leads to stress, which manifests itself as dis-ease, illness, anxiety, phobias and addictions. 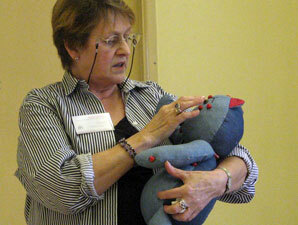 EFT Practitioner Diane Holliday demonstrates the tapping points on a surrogate teddy bear. Yes, you’ll feel silly to start with, everyone does, but it is highly therapeutic, has no bad side effects and can genuinely work for you. Do it as frequently as you need to. It can also work for children and animals; Diane usually does this using a surrogate teddy bear or fluffy dog, repeating the mantras while tapping the relevant acupuncture points on their fur. Simples! The day after Diane’s talk, I met a friend in the supermarket who had been there too, and we both agreed we’d had the best night’s sleep in a long time.